Soak the bulgur wheat in lukewarm water for about an hour. Boil the beans and leave aside to cool. Place the ingredients in a bowl and stir in the finely chopped spring onions, thinly sliced turnips,cherry tomatoes cut in four and the finely chopped dill. Prepare the oil and vinegar dressing and pour in the salad. Season to taste. 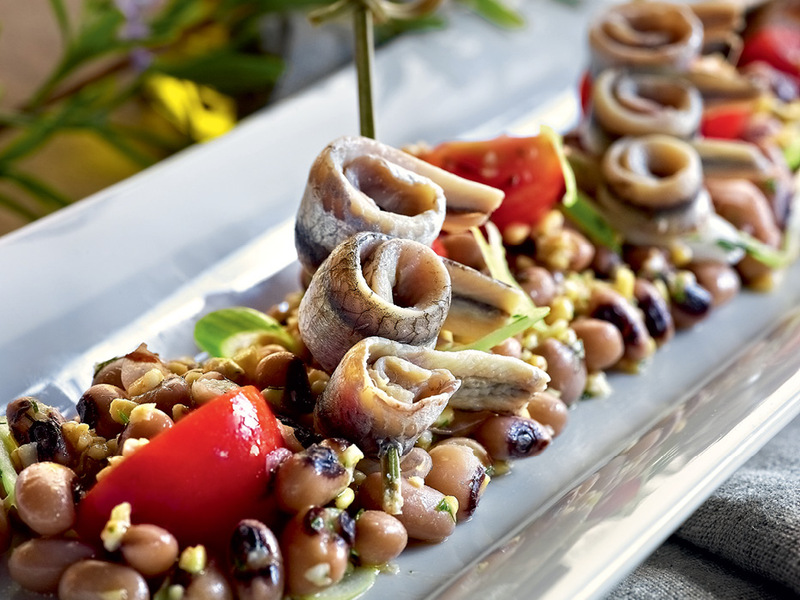 Serve the salad as a base and place the marinated anchovies on top. TIP: Anchovy (gavros in Greek): although an appetizer, anchovy is a type of food that assists with digestion. It contains plenty of omega-3 fatTY ACIDS, good for the heart and the bloodstream. It has a high content of calcium and phosphorus. Anchovy is not only nutritious, it is as tasty as it gets. YOU CAN FIND IT GRILLED, FRIED, STEAMED, EVEN STUFFED. TRY IT!